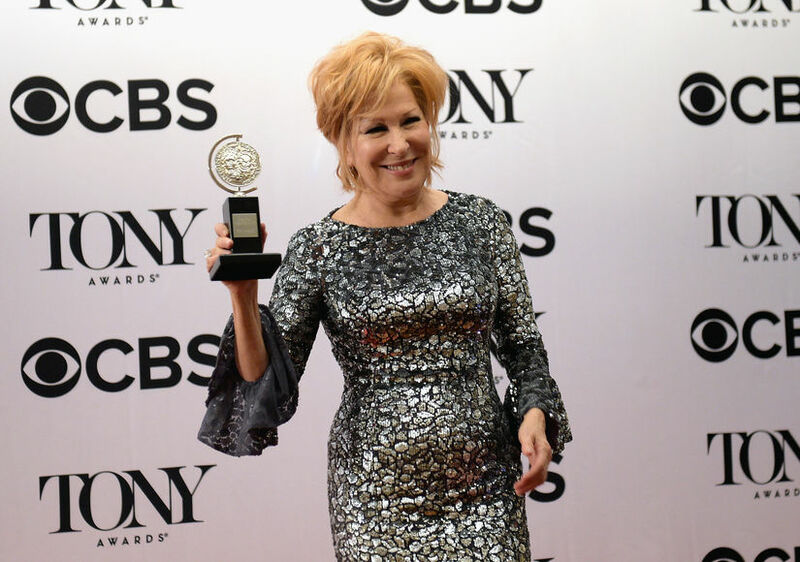 Last night, Bette Midler won her first-ever competitive Tony, for Best Performance by an Actress in a Leading Role in a Musical in “Hello, Dolly!" Midler beat out Patti LuPone ("War Paint"), Christine Ebersole ("War Paint"), Denée Benton ("Natasha, Pierre and the Great Comet of 1812") and Eva Noblezada (Miss Saigon"). After taking the stage to accept the award, Midler spoke for four minutes, far longer than the 90 seconds allotted to her. When the music started to play, a hint for her wrap things up, Midler responded, "Shut that crap off!” Watch! The star-studded audience reacted with applause and cheers as Midler went on to say, "['Hello, Dolly!'] has the ability to lift your spirits in these terrible, terrible times." At the end of the night, Midler, 71, tweeted, "In all the pandemonium tonight I neglected to thank the brilliant ensemble of ‘Hello Dolly', whom I adore. Please forgive me kids! I'm old!" The show was hosted by “House of Cards” star Kevin Spacey. For more pics from the red carpet, check out our gallery!